St. Paul Red Cross blood drive — 1:30 to 6:30 p.m. Dec. 5. The American Red Cross is facing a severe blood shortage and has issued an urgent call for eligible individuals of all blood types to donate blood. This blood drive will be at the St. Paul Fire Hall, 4233 Church Ave., St. Paul. While walk-ins are welcome, anyone can schedule an appointment by using the ¬Red Cross blood donor app, visiting RedCrossBlood.org or calling 1-800-RED CROSS (1-800-733-2767). To be eligible to give blood, potential donors must be at least 17 (16 with parental consent) weigh at least 110 pounds and be in general good health. Holiday craft and gift fair looking for vendors — 9 a.m. to 3 p.m. Dec. 8. Tables are available for $10 at the Woodburn United Methodist Church's holiday craft and gift fair. Call Judy at 503-902-2501. Living Christmas Story — 6 to 8 p.m. Dec. 14-16. For the sixth year in a row, the story of Christmas comes alive through the Living Christmas Story hosted by Hoodview Church of God. This outdoor event gives viewers the choice to either walk or drive through 13 different scenes from the life of Christ, from the announcement of his birth to the traditional nativity scene and even scenes from Jesus as an adult, including his death and resurrection. The scenes also include seven still-life sets with colorful backdrops, live animals and vividly costumed characters. The event is free and seasonal refreshments are provided. Hoodview Church of God is located at 1530 Mount Hood Ave. in Woodburn. For more information, call 503-981-1660 or go to www.hoodviewchurchofgod.com. Men's Basketball 2019 Winter League — Jan. 13–March 10. Early registration Dec. 17 is $550/team. Late registration (by Dec. 24) is $600/team. Recreational league with referees. Games played on Sundays, 8-week session (includes playoffs). Playoffs on March 10. For more information and registration call Woodburn Recreation and Parks 503-982-5266. Senior Book Club — 10 to 11 a.m. Dec. 17. This is the final book club of the year. December's book selection is "Lost Lake" by Sarah Addison Allen. Meet at Country Meadows in the second floor to discuss the book and have coffee, cookies and conversation. Books available at the library circulation desk. Country Meadows, 155 Evergreen Road, Woodburn. Who's On Third concert — 3 p.m. Dec. 16. This concert at Woodburn United Methodist Church, 700 N. Cascade Drive, will feature the "Bells of the Cascades" presenting its "Christmas in the Cascades" concert. This handbell group is one of the premier (advanced) handbell choirs in the Pacific Northwest. A freewill offering will be taken to continue financial support of this community concert series. There will be a mid-concert intermission with refreshments provided by Country Meadows and Cascade Park. Dinner at Amalfi's and Winter Wonderland — 3 to 7 p.m. Dec. 18. Register by Dec. 10. Start at Amalfi's Italian Restaurant in Portland for dinner. 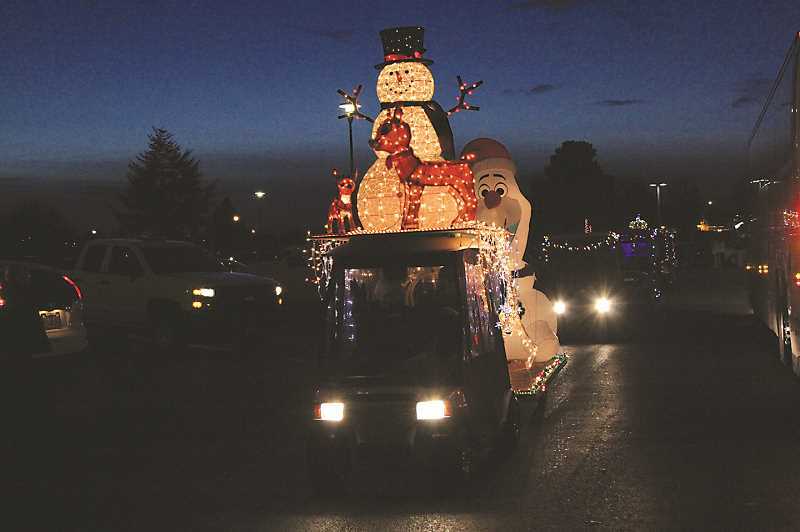 Then on to the Winter Wonderland at the Portland Raceway, where you will enjoy the "Largest Holiday Light Show West of the Mississippi." $18 includes transportation and admission. Dinner is on your own. To register contact: Recreation and Parks 503-982-5266. Scene to Screen: YA Book/Movie Club — 4:30 to 7 p.m. Dec. 20. "Nick and Norah's Infinite Playlist" by Rachel Cohn and David Levithan. Read the book, then watch the movie and discuss which was better. There will be fun conversation and snacks. This will be in the multipurpose room at the Woodburn Public Library, 280 Garfield St. 503-982-5252. "Nutcracker" — 7 p.m. Dec. 22. Willamette Ballet Academy presents its 25th Nutcracker event at Canby Fine Arts Center. A full-length Nutcracker complete with full sets and costumes makes this a holiday performance for young and old alike Tickets, which are $15, are available at Willamette Ballet Academy in Woodburn, Cutsforth's Thriftway in Canby, or at the door. For more information call 503-982-5053.